We in Minnesota: Recipes that I adore and can cook and that has my husband asking, "Who brought us dinner?" Recipes that I adore and can cook and that has my husband asking, "Who brought us dinner?" So easy and so good. A very happy meal. Makes my tummy feel joy. 1. Melt margarine in large saucepan over medium heat. Add onion and cook until tender. 2. Add carrots and celery and cook for 10 minutes or until carrots become slightly tender. Add chicken broth, potatoes, salt and pepper. Bring to a boil and allow to simmer for 15 - 20 minutes or until all vegetables are tender. 3. Add milk and parsley and heat to just boiling. 4. In a separate bowl, stir cold water into cornstarch. When completely dissolved, add to hot soup, stir and serve. 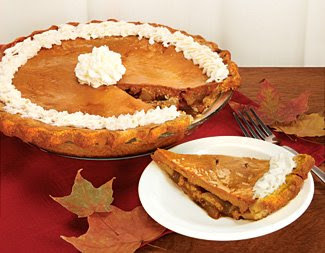 Apple pie or pumpkin pie? Can't decide? This is the pie for you. A layer of tart apples in a caramel sauce covered with a layer of traditional pumpkin. Add some fresh whipped cream and you're in heaven. To prepare the crust, cut the butter into small pieces; it doesn't have to be cold, but it should not be warm to the point of melting. Add the flour, CREAM OF TARTAR, and salt, beat or mix by hand to combine. Add the milk in a thin stream, mixing until thoroughly blended. Sprinkle a wooden board or counter top with flour, place the dough on the board, and sprinkle the top of the dough with flour. Using short strokes with a rolling pin, roll it from the center to the edges until it is 1/8 to 1/4 inch thick. You will want to turn the dough over and re-dust with flour halfway through. Roll until the crust is about an inch larger than your 9 inch pie pan when inverted. Fold the crust in half and in half again so that it looks like a triangle. Place it in the ungreased pie pan with the point in the center. Unfold the crust and ease it into the pan. Roll the edges of the overhanging crust under so that you have a nice rim around the pie plate. Set aside. In a roomy skillet, combine the brown sugar, cornstarch, 1/2 tsp. CINNAMON, and 1/4 tsp. salt. Add the PURE VANILLA EXTRACT, water and butter and bring to a boil, stirring constantly. The mixture will thicken, creating a caramel sauce. Add the apples and continue cooking over medium heat for 4-5 minutes, stirring constantly. Pour the mixture into the unbaked pie crust and set aside. In a mixing bowl, whisk together the pumpkin, evaporated milk, sugar, egg, 1/2 tsp. CINNAMON, NUTMEG, ALLSPICE and 1/4 tsp. salt. Pour over the apple layer.